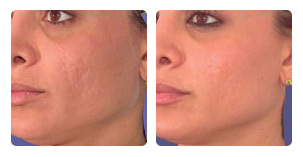 Equipped with both the Pixel Erbium Laser and an IPL, Dr Dhobb is able to perform a wide range of treatments. Lasers and IPL (Intense Pulsed Light) devices use energy from light to perform the treatments. IPL is classified as a Cosmetic Laser but is different than a true laser. 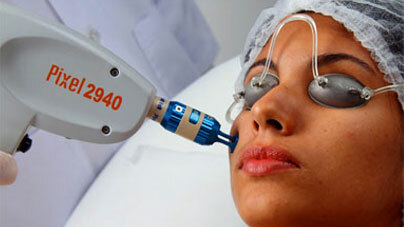 IPL is most often used to treat pigmentation issues. It is an excellent treatment for sun spots and works pretty well on small blood vessels that cause redness of the skin. 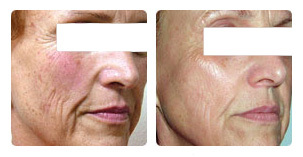 Pixel Erbium Laser is an ablative, fractionated laser, designed to resurface the skin by smooth out wrinkles and scars. The Fractional Laser penetrates deeper into the skin than an IPL treatment. Non-ablative fractionated skin resurfacing has become very popular, as it involves little or no downtime and delivers great results for mild to moderate skin wrinkling. The process is so gentle that the neck, chest, hands and face can all be treated. Quick 20-minute treatment time. Easy, in and out procedure. Facial wrinkles can be treated non-ablatively, contributing to a more youthful appearance. Imperfections such as erythema of rosacea, superficial telangiectasia, dyschromia, age spots and other discolored signs of photoaging can be gently heated and eliminated, replaced by newer, younger looking skin. In most cases, pigmented lesions are a cosmetic concern. Some are caused by sun exposure, others by aging. Still others are congenital. Regardless of the cause, pigmented lesions are simply spots on the skin where there is a higher concentration of melanin. Some lesions are flat; others are raised. Acne is a common condition characterized by obstructed sebaceous glands, pimples and sometimes deeper cysts or nodules that occur on the face, neck, chest, back, shoulders and upper arms. 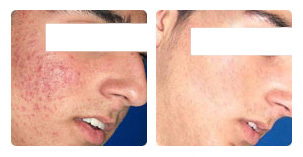 Acne usually affects teenagers but also adults can suffer with acne. Severe acne can often result in scarring. Even less severe cases can lead to scarring, if not properly treated. Aging, sun exposure, heredity and lifestyle factors may contribute to facial wrinkling, and prior acne may have made the surface of skin uneven. 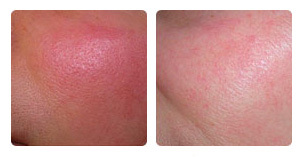 These problems, as well as certain other skin conditions, may be improved with the Harmony Laser System. It is perfect for the treatment of fine lines, wrinkles and photo-aged skin, as well as mild acne scars. At Marbella Vein & Beauty Clinic we have various devices for skin resurfacing to face all skin conditions. Excellent tools to treat the aging skin, erasing the thin lines, giving a global skin rejuvenation with a healthy shiny aspect. A complete treatment of the face and body with great and durable results of skin improvement, skin tightening and lifting effect. IPL or laser treatment of any kind have risks associated with them and need to be performed by a licensed professional. Dr Dhobb, MD PHD at The Marbella Vein & Beauty Clinic is trained and experienced in the IPL and laser treatment. He is director and owner of the Marbella Vein & Beauty Clinic, a Consultant Vascular Surgeon and University Master in Aesthetic Medicine. He offer his patients a complete range of well being and beauty enhancement in a safe environment using the best products and the last technology.